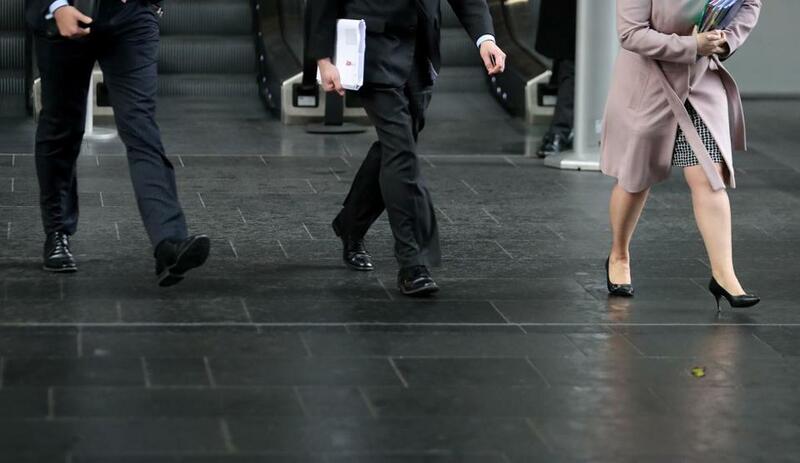 Business men and women walk in London in April. With a July 1 deadline looming, companies are scrutinizing their payrolls and adjusting recruiting to comply with the state’s new pay equity law. Even companies that have been mindful of the gender wage gap over the years are finding disparities as they prepare for the Massachusetts Equal Pay Act, which will be one of the strongest pay equity laws in the country. Three years ago, Tufts Health Plan in Watertown hired an outside firm to conduct a formal pay review of its 2,700 employees, and found no gender disparities. This year, the health insurer conducted the review again, this time using guidelines from the new law, and determined that seven employees, six of them women, were being underpaid by $4,500 to $6,000 a year. Earlier this month, they all got raises. Conducting this type of audit is a cornerstone of the new equal pay law, designed to make it more palatable to employers by giving them a defense against wage discrimination claims. If a company can show that it conducted a pay survey within the last three years — and took steps to close any illegal pay gaps — it has an affirmative defense in court. If not, it could be in trouble. Another major component of the law: Employers can no longer ask job candidates about their previous salaries. This makes it more difficult for hiring managers to offer wages that are only slightly higher than what a person made before — a practice that perpetuates the pay gap for women, whose salaries are historically lower than men’s. For PharmaLogics Recruiting in Quincy, which screens hundreds of pharmaceutical job candidates for clients every week, the requirement is especially tricky. In an attempt to educate employers about the damage using salary histories can do, chief executive Megan Driscoll decided to apply the Massachusetts law to its clients in all 23 states that it serves. One of its biggest Massachusetts clients demanded that the recruiter continue to obtain salary information right up until the law goes into effect. “This is going to cause a little chaos,” Driscoll said. Driscoll said she found no pay inequities when she analyzed her own staff, and tries to keep it that way by sharing salary levels openly with her nearly 100 employees. Most pay gaps are unintentional, said Jee-Yeon Lehmann, a vice president at the Boston economic consulting firm Analysis Group, which partners with law firms to conduct statistical analyses of compensation data. For example, if a company happens to hire more women during a time it is struggling financially — and therefore pays them less than it otherwise might have — it could create, or exacerbate, pay disparities. In Massachusetts, women make 18 cents on the dollar less than men on average, according to several analyses of census data. Much of that gap is explained by gender differences in job choices and time taken off to care for children, but an estimated 38 percent of the gap, or about 7 cents, is not easily explained and is widely attributed to discrimination and gender stereotyping. The Boston Women’s Workforce Council has started compiling anonymous wage data from companies in Greater Boston, and according to its analysis of 2016 wages, which also includes race, white women make 75 cents for every dollar white men make, while African-American women make 52 cents, and Latina women make 49 cents. Nationwide, the gender wage gap hasn’t budged much in recent years, but the issue has been getting a lot of attention. About two dozen state and local pay equity laws have been enacted in the past three years, most of them far more robust than the generic pay discrimination laws on the books in many states, according to the national labor law firm Littler Mendelson. Pay equity lawsuits are also on the rise, according to the firm. Companies are starting to become more proactive about analyzing their payrolls for a pay gap, although few admit when they find one. In April, however, Salesforce.com CEO Marc Benioff revealed on “60 Minutes” that his company had paid $6 million to rectify gender pay gaps — half in 2015, and the rest in 2016 after it acquired several companies. At a recent Harvard Law School panel about pay equity, Attorney General Maura Healey, whose office is tasked with enforcing the new state law, noted that companies shouldn’t just stop at adjusting payrolls and eliminating salary history questions. They need to look into providing child care, paid parental leave, and pregnant worker protections, as well as holding unconscious bias training, she said. “There are a lot of factors that go into systemic disparities that have persisted way too long in our culture and our society,” she said. The law outlines six instances in which pay differences are allowed between comparable positions: if someone has more seniority; more education or experience related to the job; better performance reviews; higher sales or other quantifiable contributions; lives in a more expensive city; or travels more. Still, parts of the law could be open to interpretation in court, said Boston employment lawyer David Robinson, such as what is “comparable work,” and what constitutes a “good faith, reasonable self-evaluation” of pay practices. And while pay audits provide protection at the state level, they won’t help in a federal claim — “and then you have a paper trail that shows that you aren’t paid equally,” Robinson said. Even companies that achieve pay equity are in danger of throwing it off every time they make a new hire or hand out raises. To combat that, HubSpot, the Cambridge marketing software firm, has created a program that totals the average annual raise per gender in each department to make it easy to see if there’s a substantial difference between the two. “It’s made our entire leadership team more acutely aware of the role we all play in it,” said the company’s chief people officer, Katie Burke. Burke declined to say if a recent payroll analysis uncovered a wage gap, but she noted that the company eliminated the salary history question for job candidates in its offices around the world. HubSpot also upped its paid maternity leave benefit to 16 weeks and paternity leave to six weeks, steps not required by the pay equity law. Shorelight Education is also using technology to help it keep an eye on the pay gap. The Boston firm, which helps universities recruit and support international students, is customizing its human resources system to trigger an alarm if an offer letter is drafted that would throw off the balance. Tracking the pay balance day to day rather than every few years makes it easier to manage, chief executive Tom Dretler said. It’s also good for business. “When employees know they’re being treated fairly, it increases their desire to perform and to stay with the organization,” he said.